If the shelter had a school, Terrence would be valedictorian! He is one super smart and playful puppy. Since he doesn't get much chance to play these days, Terrence tries to make everything into a toy--including leashes! 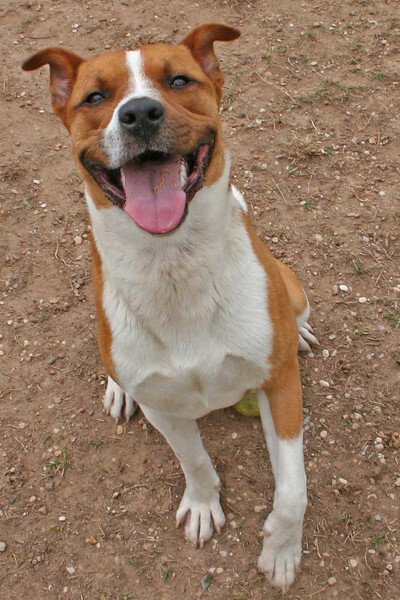 (Try distracting him with a chew toy when you walk him here at TLAC.) Learning how to sit for treats was a breeze for Terrence, and he is ready to study lots more skills. Terrence appears friendly with other dogs and is very affectionate with people, wiggling all over and pressing up against you whenever you pet him. Terrence promises years of fun and affection to the active forever home that will enjoy giving him the exercise and mental stimulation he loves.